The City of Winnipeg (the City) is committed to building pedestrian and cycling infrastructure for people of all ages and abilities. The City is currently undertaking the Wolseley to Downtown Corridor Project to identify options to improve travel choices, accessibility and connectivity. The study area runs east-west through Wolseley Avenue/Westminster Avenue, Balmoral Street, and Granite Way. As part of the study, the project team will seek input from various stakeholders in the project area in the coming months to help determine the specific alignment and other important considerations in the design process. Go to Public Engagement Projects Listing. March 2019 – Development of preliminary options is currently underway. The timeline of this project has shifted, with the phase 2 of the public engagement program planned to begin this spring and will ask for your input on design options and alternatives. January 2019 – Results from Phase 1 of the public engagement program are now available as a public engagement summary and report under the documents tab. Thank you to everyone who provided feedback during Phase 1. 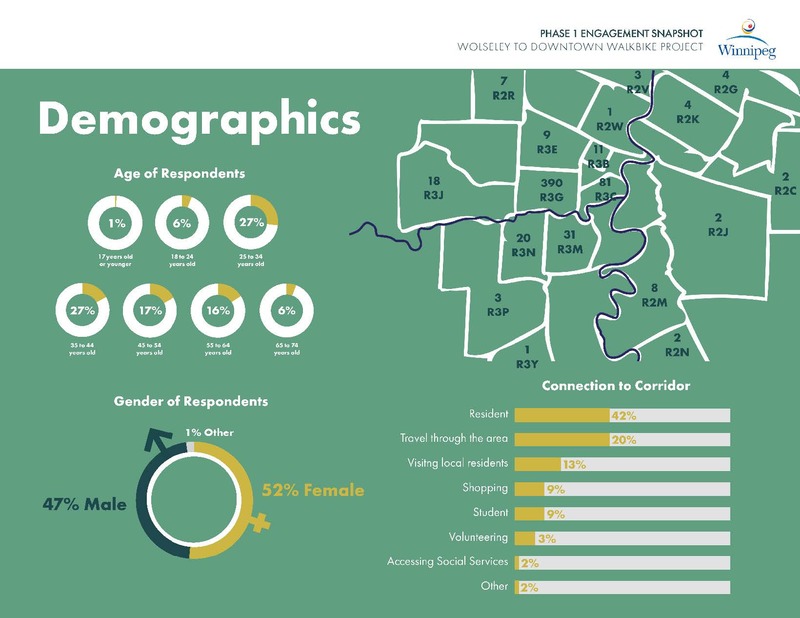 A total of 844 surveys were completed and the project team recorded 613 in-person interactions at project pop-ups between November 23 – 25, 2018. Results from Phase 1 of the public engagement program are now available as a public engagement summary and report under the documents tab. The purpose of Phase 1 of public engagement was to help identify options to improve travel choices, accessibility, and connectivity in the study area. 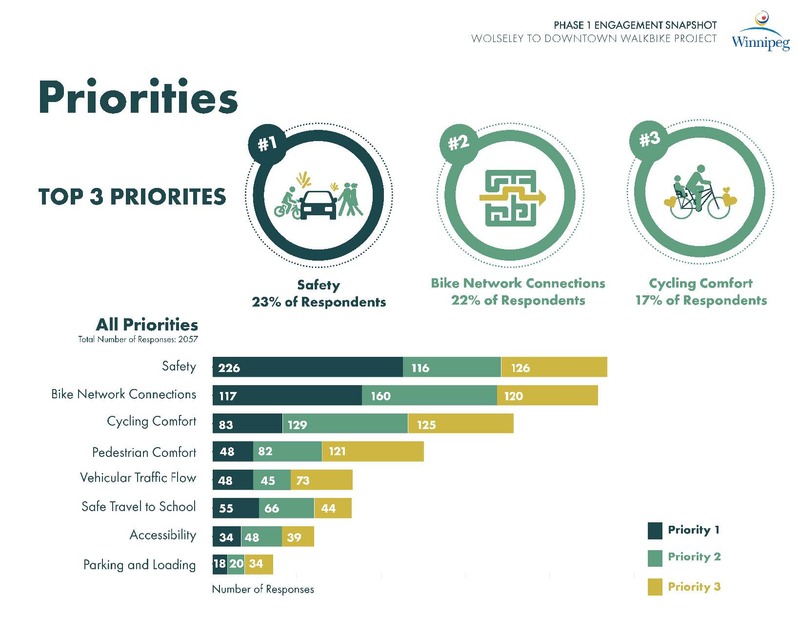 Residents and stakeholders were asked to identify values, strengths, issues, and barriers to active transportation within the study area, specifically related to mobility and safety. This input from Phase 1 will directly influence the design process and the development of alternatives. Phase 2 will focus on providing the public the opportunity to review and provide feedback on the preliminary design options and alternatives. Phase 3 will focus on sharing the final design recommendation and highlighting where public input influenced the design of the project. For inquiries or for those who require alternate formats or interpretation in order to participate, please contact John Osler, Public Engagement Lead at wolseleydowntown@intergroup.ca or 204-942-0654. Results from the School Travel Planning activities are available in the Phase 1 public engagement summary and report under the documents tab. School Travel Planning and Engagement began in November 2018 at three schools within the study area: Wolseley School, Mulvey School, and Laura Secord School. The goal of School Travel Planning is to encourage more students and parents to walk, scooter, and cycle to school, enhance school and traffic safety in the area, and improve overall options for people of all ages and abilities to walk or cycle in the community. These three schools collected data on how their students travelled to and from school, participated in classroom hands up surveys to determine transportation mode share, completed family take home surveys, took part in school-based events and guided bike rides and walks, and participated in collaborative design workshops. The data and feedback from the schools will be integrated into the overall Wolseley to Downtown Walk Bike Project, and will be closely considered when developing the corridor design. Thank you to all of the families who took time to fill out the first school travel planning survey. A total of 285 completed surveys were received. The Pedestrian and Cycling Strategies (PCS) were approved by City Council in 2015 and provide the long-term vision for providing accessible, convenient and safe walking and cycling facilities for people of all ages and abilities. The PCS also assist in the prioritization of active transportation infrastructure projects throughout the city. A key direction of the PCS is to develop local bike networks for each neighbourhood that connect to the existing network and to the Downtown. The Wolseley to Downtown Walk Bike Project was identified as an important part of the network in the PCS and when completed will provide connections to the Omand's Creek pathway, the protected bicycle lane on Assiniboine Avenue and Sherbrook Street, the bike lane on Maryland Street, and the planned neighbourhood greenway on Ruby Street. The City is currently undertaking the Wolseley to Downtown Walk Bike Project to identify options to improve travel choices, accessibility and connectivity. The study area runs east-west through Wolseley Avenue/Westminster Avenue, Balmoral Street, and Granite Way. As part of the study, the project team will seek input from various stakeholders in the project area in the coming months to help determine the specific alignment and other important considerations in the design process. Starting in November of 2018, school travel planning will take place at three schools along the study corridor: Wolseley School, Mulvey School, and Laura School. These three schools will collect data on how their students travel to and from school, including in-classroom hand-up surveys to determine transportation mode share and family take home surveys, undertake events and guided bike rides and walks, and will participate in collaborative design workshops. A variety of stakeholders will be engaged on a school walkabout to examine the barriers to active transportation in the community, and to discuss potential school transportation goals, barriers, and solutions. Students will also be engaged through participation in several classroom presentations, as well as photovoice workshops that visually document their perspectives along the corridor. This data and feedback from the schools will be integrated into the overall Wolseley to Downtown Project, and will be closely considered when developing the corridor design. Additional public engagement sessions will be held to gather input from area residents. It's anticipated that the preliminary design will be presented to Council for its consideration of the project and budget in summer 2019. Why is the Wolseley to Downtown WalkBike Project being considered? The Wolseley to Downtown connection was identified as an important part of the network and will provide connections to the Omand's Creek pathway, the protected bike lane on Assiniboine Avenue and Sherbrook Street, the bike lane on Maryland Street, and the planned neighbourhood greenway on Ruby and Banning Streets. What is the project area, what streets may be impacted? What kind of bike infrastructure is being considered as part of this project? Public feedback is also an important consideration in the design process. Will there be a loss of on-street parking and loading zone space as a result of new cycling infrastructure? At this stage, no specific design features have been determined. The City will seek to maintain as much on-street parking and loading as possible, balanced with the need to ensure the safety of other users of the route. Wolseley Avenue from Raglan Road to Maryland Street is currently a Sunday/holiday bicycle route, could this project remove that designation? As part of the study, the project team will seek input from various stakeholders in the project area in the coming months to help determine the specific alignment and other important considerations in the design process. It's anticipated that the preliminary design will be presented to Council for its consideration of the project and budget in summer 2019. Construction will not occur before Council approval. As part of the Preliminary Design, construction costs will be established. Winter lasts about half a year. Why are we putting in bike lanes? The City's Pedestrian and Cycling Strategies commits to providing and maintaining safe walking and cycling facilities year-round. Separating pedestrians, cyclist and vehicles is the safest way to accommodate each mode of transportation. A high proportion of children within the study area walk and cycle to school. This, along with public feedback, will be an important consideration in the design. 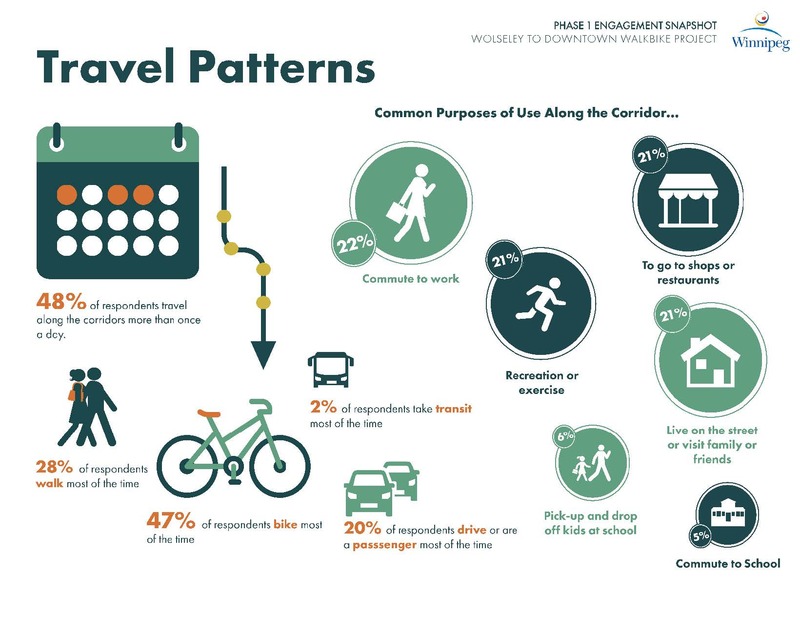 The Pedestrian and Cycling Strategies (PCS) is a planning report approved by City Council in 2015 and provide the long-term vision for providing accessible, convenient and safe walking and cycling facilities for people of all ages and abilities. The PCS also assist in the prioritization of active transportation infrastructure projects throughout the city.